HBO has released several new images for Game of Thrones Season 8. While details about the final season are still being kept under wraps, the latest images provide our best look yet at the upcoming episodes. Fans were hoping that the Super Bowl advertising gods would bless them with a trailer, but that didn't work out so well. However, in a move that nobody expected, HBO paired with Bud Light to release the best commercial of the year, introducing the Mountain and a dragon from the hit show to the big game. Now that the Super Bowl dust has settled, HBO has released fourteen images from Game of Thrones Season 8. Included in the images are Isaac Hempstead Wright as Bran Stark, John Bradley as Samwell Tarly, Lena Headey as Cersei Lannister (there's actually 2 photos of her), Peter Dinklage as Tyrion Lannister, Kit Harington as Jon Snow, Liam Cunningham as Davos Seaworth, Nikolaj Coster-Waldau as Jaime Lannister, Maisie Williams as Arya Stark, Emilia Clarke as Daenerys Targaryen, Sophie Turner as Sansa Stark, Gwendoline Christie is Brienne of Tarth, and last but not least is Conleth Hill as Varys. Out of all of the photos, there is one smile from Samwell and maybe a hopeful look from Daenerys. 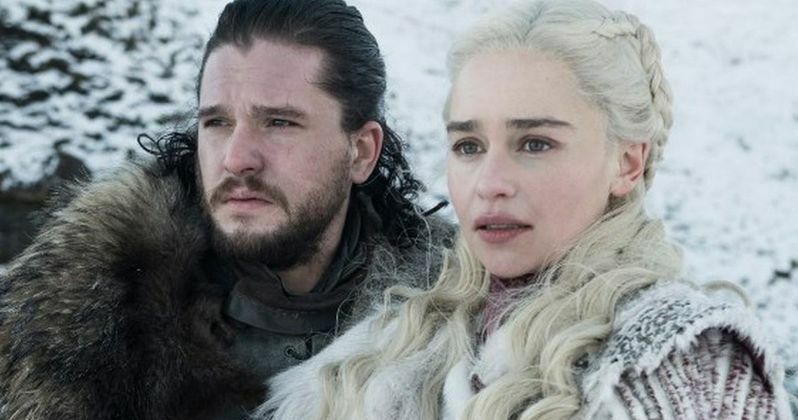 From the looks of the images and from the very brief promotional material that has been released, fans are in for a pretty dark final Game of Thrones season. Long-time fans know that things aren't going to work out the way that they hope, or at least in a way when the good guys all live and celebrate. There will be blood, and probably a whole lot of it, knowing the show and taking into account that Season 8 will provide us with the biggest battle to ever be shown in the series. Maisie Williams recently revealed that Game of Thrones fans might not all be happy when all is said and done. "I don't know that anyone is going to be satisfied," said Williams when talking about the end of Season 8. Obviously, it's tough to please everybody, which is why the show has never tried to do that. There have been serious expectations from fans who read the book and then from those who were critical of seeing the hit series deviate from the book. Williams concluded by saying, "I'm really proud of all the work we've put in... I hope people like it." While not all Game of Thrones fans are going to be satisfied with the ending, we would all be a heck of a lot happier if HBO delivered a full-length trailer in the coming weeks. Season 8 premieres in April with episodes that are a bit longer than the average episode and we need to know what we're up against here. Hopefully we get to see something in the near future. You can check out the Game of Thrones Season 8 images below, thanks to Making Game of Thrones.